Open a picture in Photoshop Elements 3. Control how tools behave when editing your pictures. Resize and print your pictures. Create a CD archive of your image files. Use effects for creative photos. Build an online photo album. 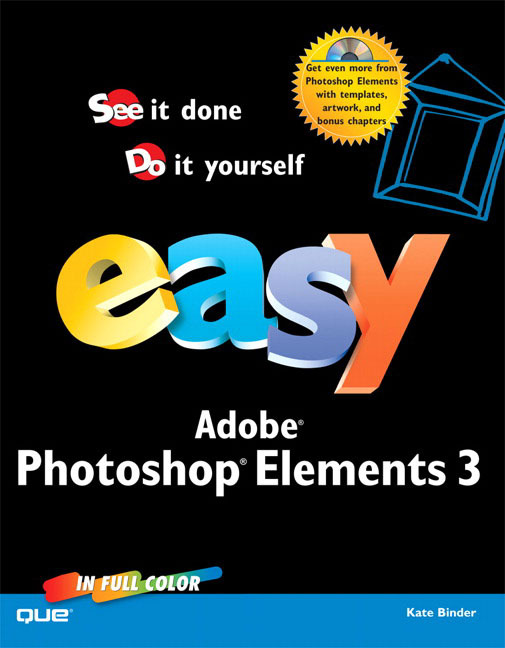 Easy Photoshop Elements 3 will have you creating digital photo masterpieces and turning them into real-life works of art in no time! Kate Binder is a design and graphics expert who works from her home in New Hampshire. She has written articles on graphics, publishing, and photography for magazines including Shutterbug, Publish, eDigital Photo, PEI, and Desktop Publishers Journal. Kate is also the author of several books, including Easy Mac OS X v10.3 Panther, The Complete Idiot's Guide to Mac OS X, and Easy Adobe Photoshop 6, and she is the co-author of books including SVG for Designers, and Get Creative: The Digital Photo Idea Book. Kate is very good at breaking a task down into its component steps and has a strong visual sense that enables her to provide useful and colorful screen shots to illustrate the tasks.